Sophie Barnes has struck gold again in her DIAMONDS IN THE ROUGH series. 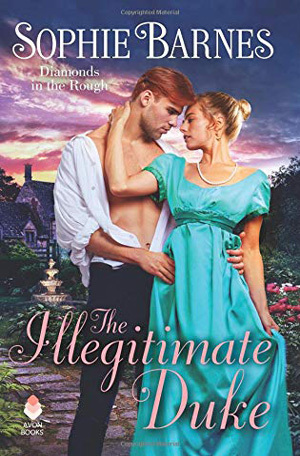 THE ILLEGITIMATE DUKE finally gives us the story of Lady Juliette Matthews, a woman who loves to learn and gain new experiences. It is her determination and curiosity that helps her realize she wants more for her life than just tea parties and balls. She wants to help people, which leads to her appreciation of Dr. Florian Lowell, soon to be the Duke of Redding. Florian cannot help but notice Lady Juliette, and her efforts to assist with his mission provide medical services to anyone who needs them, especially when she joins a committee to assist with fundraising for the hospital he runs. Juliette senses Florian’s interest in her and grows frustrated. Ms. Barnes gives voice to Florian’s sentiments perfectly when she has Florian admit, “You are sweetness itself, Juliette, and I am fortunate to have won the admiration of a woman such as yourself. Which is precisely why I cannot possibly share my reasons for why we cannot be together. Because your opinion of me is too important. I will not risk it.” This had me in tears. I could just imagine the torment Florian was putting himself through trying to protect Lady Juliette from himself. Incidents occur that pull Florian away, leading to a series of events that Lady Juliette must overcome. Events that make Florian realize that he deserves his happiness too. So much more happens, but I do not want to give away the intrigue afoot. Trust me, you will enjoy this book!